We thought we must be back in the UK when we woke up this morning as it was lashing down with rain and the temp had plummeted. 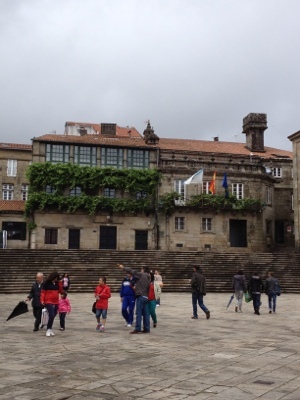 We had thought we would take the opportunity to visit Santiago de Compostela. 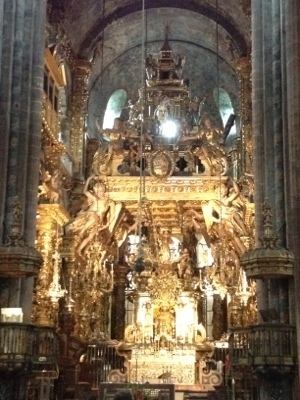 It supposedly has the remains of St James the Apostle and has been a pilgrimage site for centuries. Apparently, it looks better in the rain as the water flows down the streets and gushes from the gargoyles but after it hadn’t stopped raining for hours we weren’t so sure! It is a medieval town with many churches, alleyways and cobbled streets all of which are pedestrianised so we spent the day wandering round and visiting the cathedral. It is an impressive structure whatever your views on religion and the audio guide for €3 was a bargain. Bizarrely, there weren’t candles to light in honour of loved ones but you could put cash in a slot machine to light a bulb on a fake candle. My mother would have turned in her grave! The other thing that Santiago is apparently famous for is chocolate and we decided to sample the local delicacy of pure melted chocolate with sausage shaped doughnuts called churros. Delightful but sharing one was more than enough. 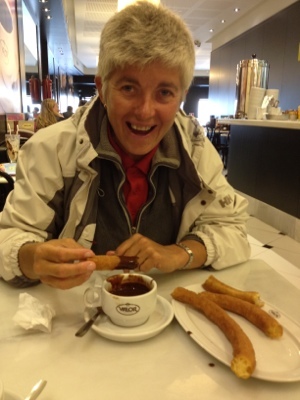 Is that Liz, giggling over her churros?! Looks like you have arrived in a lovely part of the world. Yesterdays photos were stunning and hopefully well worth the night of anchor watch. Wish I was there. Still, the sun is shining here and it’s Pride in Bristol tomorrow, so have an exciting weekend ahead. Yes we have churros and chocolate here and it has ruined many a lunch as you dont need to eat for the rest of the day but they are delightful.Ours are served with hot molten dark chocolate. Great for a winters day!!! !